Achieving sound quality competitive with the very best preamps available today! It's time for me to give it a rest. From this point forward, I'm not going to criticize anyone for incorrectly substituting the term "preamplifier" for "linestage", or vice versa. Basically, a preamplifier is a component that provides gain to send to the power amplifier, and contains an internal phono preamplifier, or even might contain an internal digital-to-analog converter. A linestage is one that has no other functions besides providing gain. Of course, both can switch between multiple sources and provide impedance matching between it and the power amp. This means that the Merrill Audio Christine Reference is a linestage, and not a preamplifier, even though that is what Merrill Audio calls it. However, I concede, and admit that this isn't the time to go into this any further. Since Merrill Audio designs and builds the Christine Reference, they can call it anything they wish. The Christine Reference is built with the same very good-looking cabinet as the Merrill Audio Jens phono preamplifier, which was reviewed by Ron Nagle in the April 2015 issue of Enjoy the Music.com's Review Magazine. Ron raved about the performance of the Jens phono stage, he nominated it for both a Blue Note award and an Enjoy the Music.com 20/20 award. Other than both using same cabinet, and both using an external AC/DC power supply, I doubt that the Merrill Audio Jens and Christine Reference have much else in common. Or perhaps they do. 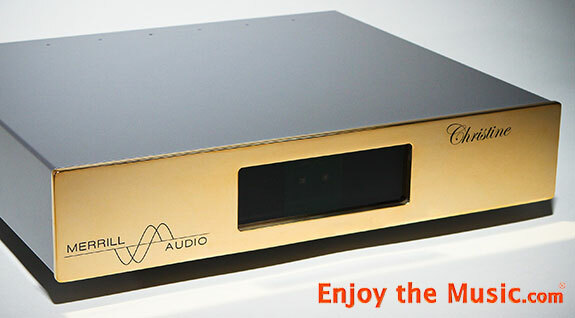 Merrill Audio's Merrill Wettasinghe is welcome to comment at the end of this review if he wishes. But this is hardly necessary, as these two components aren't used in the same way. Although both component's front panels have the same sleek looking high-gloss gold finish, only the Christine Reference has a 1.25 inch LED 8x8 matrix display in its center which shows its volume and other functions in large characters. There are no controls on the unit's front panel, as all the preamplifier's functions are controlled with an Apple remote that is provided. There is a special something that separates the very good from the excellent in high-end audio, and if we're willing to take the word of Merrill Audio, the attention to detail that they lavish on the Christine Reference is the reason why this component is in the excellent category. They claim that they use the "finest" internal components, the PCB layout is hand-routed, they use silver-plated pure copper wire and consider not only the placement of each copper trace, but the length of each trace. The Christine Reference is a fully balanced component, which means that the Christine Reference is balanced from input to output. Each unit is hand-built, and tested, and since the power supply of the preamplifier is connected by an umbilical it allows the power supply to be located far away from the preamplifier's cabinet, the distance is responsible for lowering the component's noise floor, among other sonic benefits. 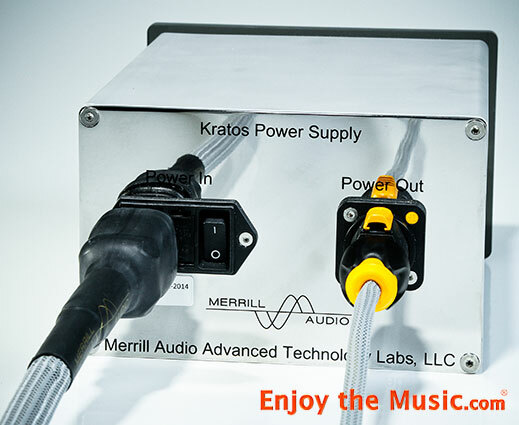 Merrill Audio's multistage Kratos power supply enables one to use any power cable one wants with the Christine Reference � after-market cables make no difference to its sound quality since the unit is impervious to noise on the AC line. Some of the other features of the Merrill Audio Christine Reference preamp include its dual independent outputs, and four balanced inputs that are programmable, allowing each its own gain preset so one can normalize all the input volumes. The Christine Reference also allows one to set a minimum and maximum volume setting. The maximum volume setting is useful feature, enabling the user to protect one's speakers so the volume of the preamp can't be accidentally set to a dangerously high level. The display brightness can be changed or turned off completely, and one can set the preamp to have a delayed automatic turn-off which shuts the power off after a certain amount of idle time. It's nice to see that the Christine Reference also includes an absolute polarity control, which is something that isn't seen on enough preamps � many audiophiles are finding that some of their favorite recording sound even better when the polarity is reversed. The Christine Reference has other settings, too, such as balance, all which are set by scrolling through the preamp's menu. These settings are non-volatile, that is, they are saved even if the power cord of the preamp is disconnected from the AC. The $12,400 Christine Reference was auditioned in a system that I feel is worthy of a preamplifier of this caliber. The front-end consists of my Basis Audio Debut V turntable, with a Gold Note Tuscany mounted on my Tri-Planar 6 tonearm. The Van den Hul Crimson Stradivarius phono cartridge that I reviewed in the January 2017 issue was also used, but had to be returned early in the review, so I spent the bulk of the time using the more valuable Gold Note Tuscany moving coil cartridge. 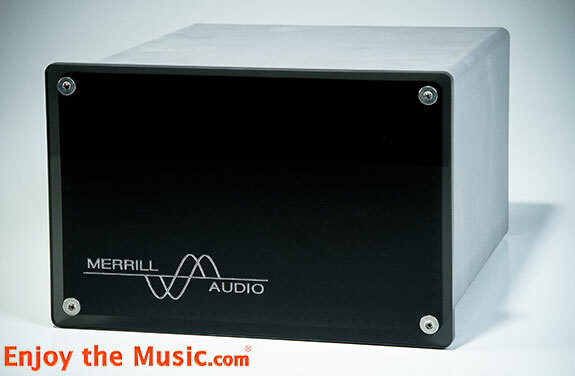 During the first half of the review period I also had Merrill Audio's Jen phono stage in my system. The Merrill's phono preamp is a perfect match when used with the Christine Reference preamplifier. The audition period also overlapped with the review of the Dan D'Agostino phono preamp reviewed last month, which remains in my system. It was very nice to have the Jens to gain some perspective on the performance on the nearly twice as expensive D'Agostino. Power amplifier remains my Pass Labs X350.5, and the speakers the Sound Lab Majestic 545 full-range electrostatic speakers (review forthcoming), along with a Velodyne 15" subwoofer. The digital front-end consists of a computer-based music server, a Furutech USB cable sends signal stored on hard-drives to an Auralic VEGA digital-to-analog converter. When spinning silver discs, I use an Oppo BDP-83 Special Edition universal disc player. I agree with some that my digital front-end might need upgrading. All the analog front-end needs to keep up with the times is an occasional cartridge upgrade. Digital playback continues to advance at a rate a zillion times faster than analog, but such is the life of audiophile equipment, and the audiophile who wishes to engage in the hobby. The same is true for its dynamics, so the preamp had a different dynamic response character when playing an SACD verses when playing an LP, because the Christine Reference let the signal pass through it unsullied. The fact that the Christine Reference's background is silent aids in making everything sound better � having a black background, as many like to call it, aids in enriching the preamplifier's micro- and macro-dynamic response, its transient response, and just about every other audiophile approved quality that I can think of. I've often said that power supply design might be the most important aspect of any component, and it is obvious that Merrill Audio didn't skimp in this area. Its rather large outboard, multistage, Kratos power supply that sits on the floor about 1.5 meters away from the Christine Reference's main cabinet is clearly the reason for its noiseless background, and therefore its excellent sound quality. The reason why the Christine Reference sounds like "an excellent preamplifier" is because when performing this review, I was lucky enough to have this preamp being fed by an extraordinary analog front-end, which includes my Basis Audio turntable set-up, plus the $28,000 Dan D'Agostino Master Audio phono preamplifier that I reviewed last month, and has yet to be picked up by its owners. The digital front-end is certainly decent, but is a more "ordinary" mid-priced high-end component. This DAC I'm currently using, which is about one tenth the price of the phono preamp's, can be compared to the D'Agostino phono preamplifier, but anyone with ears will conclude that the phono preamplifier trounces it. And so, when performing serious listening sessions with the Christine Reference, that is, when I'm parked in the sweet spot listening to music and doing nothing but listening to music, most of the time I was listening to vinyl. And who could blame me? A short time ago I acquired Mobile Fidelity Sound Labs' reissue of Santana's third LP. I played it more than a few times during the Merrill Audio Christine Reference preamplifier's audition period. This album is titled Santana, but since that's also the title of Santana's first LP most call it Santana III, even though that title is not listed on the album's sleeve. This album has basically the same personnel as on the first two, which includes of course Carlos Santana, but also drummer extraordinaire Michael Shrieve, and almost just as importantly organist and vocalist Gregg Rolie. There's quite a bit going on when playing this Santana album � there are two multi-percussionists besides Michael Shrieve, who is credited as playing percussion and vibraphone besides his regular drum kit. And besides Carlos Santana on lead guitar there is also rhythm guitarist Neil Schon (who went on to form Journey after his time in this band). The percussion on the Santana album is wonderful, adding a very complex poly-rhythmic structure to all the tunes, and the Christine Reference makes it easy to follow all the rhythms that are happening on the tunes, and all the musicians who are creating these rhythms. I could spend days talking about the sound qualities of all the instruments on this album, as the Christine Reference allows me to hear each of them on the multi-track recording, each with their own traits, yet it still sounds as if the band is playing together in the same room. For example, the hits on the skins of the conga were incredible, as I could hear Michael P. R. Carabello's palm hitting the drum, and then the sound of the body of the conga as two separate events. It is amazing, as the time between these two sounds can probably be measured in microseconds � yet in my mind it sounded as it was happening in slow motion. With the Christine Reference in my system, it was as if I could anticipate each conga hit, as if I could hear the air moving out of the way of his moving hand as it approached the drum. Another selection that made a huge impression on me was the EMI LP of Poulenc's Organ Concerto in G minor, the version with Andre Previn leading the London Symphony with none other than Simon Preston on the organ. This LP sealed the deal. This album has everything, it's a great "Bishop/Parker" EMI recording, which means that it's a great test for a system, and better yet -- it is a great piece of music, with a large orchestra and an organ. When I played this record, the Merrill Audio Christine Reference made itself noticed by not being noticed. It was the music pressed onto the record that was the star of the show. Of course, the deepest pedals of the organ that shook the room and my gut were proof that the Christine Reference could let the very, very lowest notes pass through it, sounding untouched by any electronic circuitry, and at the same time the orchestra engulfed me with sound. The soundstage was wide, deep and stretched from floor to ceiling. It also seemed to stretch beyond the back wall of my listening room when, for example, the horns announced their presence from the way, way back of the orchestra. Midrange of the Christine Reference was what gave me the impression that this component sounded neither tube-like or solid-state, it simply sounded like music. Well, it sounded like music if that was what the source was feeding the preamp, and as I previously mentioned, this preamp sounded only as good as the source feeding it. The Poulenc recording certainly did sound good. As I played this record for perhaps the hundredth time, I became once again aware that the instrumentation that Poulenc crafted into the score was fun to listen to, but this time it was even better because the Christine Reference was a champ at being able to separate the instruments and groups of instruments and place them within the soundstage in their appropriate locations. But as my system is not Kingsway Hall, it is a listening room, there was only so much it could do to replicate a proscenium that is fifty feet wide. Regardless, as the piece continued, my attention would be drawn to the sounds of the orchestra that seemed to appear in space between, behind and to the sides of my speakers, and with my eyes closed the huge Sound Lab electrostatic speakers would practically disappear into the Christine Reference's huge soundstage. It was the Santana album that revealed to me the fact that perhaps the Christine Reference puts a slight bit of sonic shade on the transient response characteristics on some recordings. These transients were not dulled, because using that term would imply that this is a severe problem. The Christine Reference does an excellent job of reproducing the transient response that is on a recording, at least when compared to the many other preamplifiers that have passed through my system during the previous year. It's just that I sometimes whished for a bit speedier recovery from some of the transients that occurred. I realize that this is sort of an obtuse observation, and was only brought to my attention because the sound of the Christine Reference is addictive. I played album after album after album, sometimes long into the night. And sometimes these late nights led to me spawn some hypercritical thoughts. And so, this complaint about the transient response is an inconsequential nit-pick, mostly because no one else that visited my listening room made mention of what I considered a minor anomaly. An astute reader might have been able to surmise that I was searching for something negative to say about the Christine Reference. That was quite difficult. The Luxman C-700u that I reviewed in September of last year led me to believe that it is one of the best preamplifiers that one could buy, and was a relative bargain at $10,000. I am now even more impressed by the excellent sound of the Merrill Audio preamp. If I had to choose one over the other, I might be upset that I'd have to give up many of the features that the Luxman has that the Merrill Audio doesn't, such as front panel controls, a tape output, and its number of both balanced and unbalanced inputs. But I'd choose the Christine Reference, because its sound quality places it within the category of the best preamplifiers available.